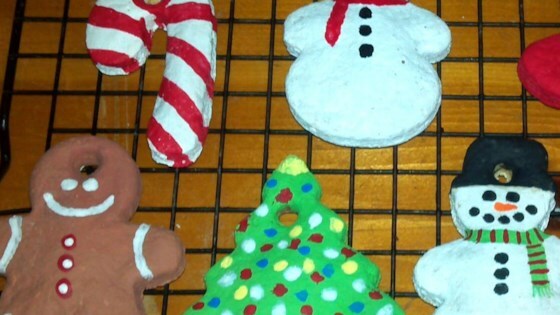 "These baked ornaments harden nicely so there is no overnight wait before decorating." Cut into desired shapes and make holes for hanging. Bake for 30 minutes; allow to cool. Decorate with poster paints or tube paints. Allow to dry and spray with clear polyurethane on both sides to preserve. Use ribbon or yarn pieces to hang. What a fun and festive holiday decoration activity! The ornaments after baking at 300 for 30 minutes were still doughy. I had to re-bake them for 40 minutes the next day. After they finally hardened, they turned out nice.